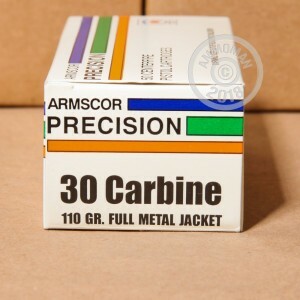 Load up your M1, Blackhawk, or other .30 Carbine gun with this affordable ammo from Armscor. 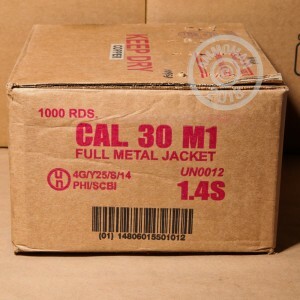 Manufactured by a major defense contractor, these rounds fire a standard weight 110 grain full metal jacket bullet and deliver accurate, reliable performance for target shooting. Each box contains 50 cartridges. Armscor ammunition uses non-corrosive Boxer primers and brass cases and is made in both the US and the Philippines. The second most prolific long gun in American history behind the M-16, the M1 Carbine and its .30 Carbine cartridge was used in World War II and the Korean War by weapon crews, paratroopers support personnel, and officers. I had been having jamming problems, but these fed through without any trouble or misfires. 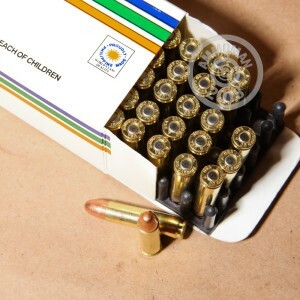 Great ammo, will definitely buy again. Have an old Inland m1 ive had for years, bought 200 rounds of this ammo and it performed perfectly, thanks for the great product.